So, I did a thing over the Christmas break. I got a tattoo. I’m not sure what your opinions on tattoos are, but I ask that you suspend them for just a moment as I tell you the reasons behind mine, and there are several. First and foremost, is that I did not take this decision lightly, and put a lot of thought into it. I know that it is permanent and will be there until the day I die, and that I will have to be okay with what I put there when I’m 80 years old. In addition to that, I gave this decision serious consideration for about 8 months prior to having it done, so I didn’t get it on a whim. When I first entertained the thought of getting a tattoo, I knew that I wanted it to be something incredibly personal and deeply important to me. Naturally, I ventured toward getting a Bible verse because my faith is such an integral part of who I am as a person. I thought through several of my favorite verses and eventually decided on Romans 8:28. This verse has been so important to me growing up. It has given me comfort and strength through many tough times and I know it will continue to do so in the future. One thing that fascinates me about this verse is the stark simplicity of it. It states He will make all things work together for our good. All things. It immediately dispels any doubts we may have about life’s struggles. Anything and everything, good and bad, even the most difficult, destructive, soul crushing things in life, will, in His perfect timing, come together for our good. And that has got to be one of the most comforting things I have ever known. I have seen it happen many times to myself and to others. Situations that I didn’t like or bad things that happened to me, have ultimately resulted in something good. Something that I couldn’t have seen in my limited sight, which is just another amazing testament to God’s perfect plan being fulfilled despite our narrow mindedness. Because my faith, and this verse in particular, have had such an impact in my life, I wanted to express it in an external way. The tattoo also serves a few other purposes. I wanted it to be a reminder to me: every time I see it, I will be reminded of this verse, and my faith, and to do everything for God’s glory. It is also a public declaration of commitment to my faith in the same way a wedding ring signifies a committed relationship between a husband and wife, or how baptism is a “public declaration of a new association” with Christ, as my pastor would put it. And finally, it is simply a conversation starter for people who see it. They ask me what my tattoo means, and I get the joy of sharing God’s impact on my life. So without further ado, here is a photo. 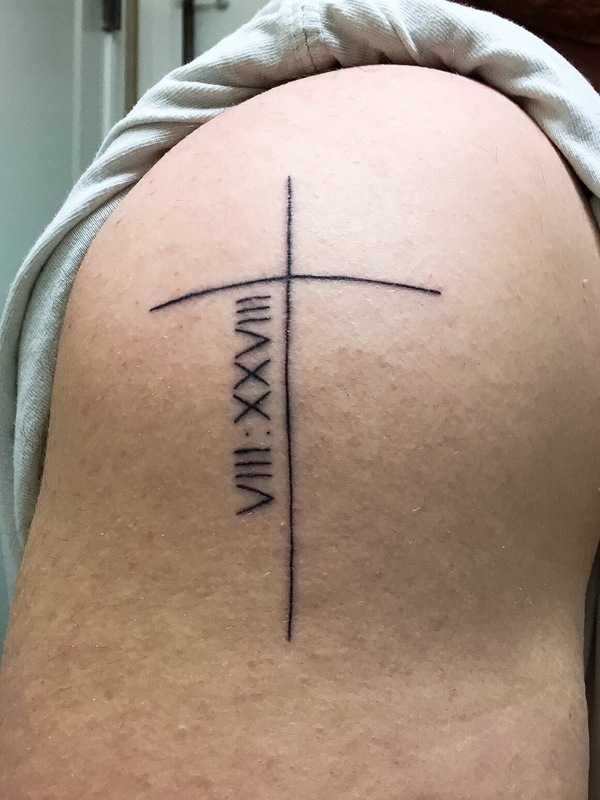 I put the verse reference in Roman numerals, and I used a simple design to reflect my own love of minimalism. Of course I also had to consider my position as a youth leader. I directly interact with students who can be very impressionable, and I took that into serious consideration. While I’m not against tattoos (obviously), I do think that students, and anyone for that matter, should think about it long and hard before getting one. Think about it for a long time. I would say 6 months at least. Make absolutely sure that it’s something you will be okay when you are 80 years old. Make it represent something very important to you. Get it somewhere easily covered. I have mine on my right shoulder. If you decide on getting a tattoo, I hope that you enjoy it as much as I do mine. I think it’s a great form of expressing part of your identity. I don’t regret it one bit, and don’t think I ever will.